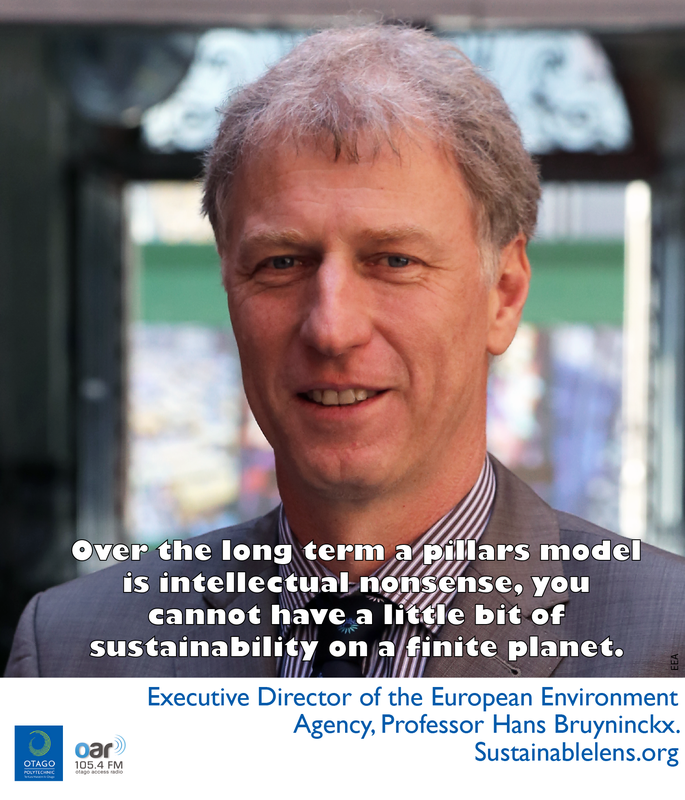 Professor Hans Bruyninckx is Executive Director of the European Environment Agency. He says we need to move from a focus on efficiency, to one of transition. It is a time we need to challenge things. We need to challenge ourselves through better analysis what is driving fundamental unsustainability – how we produce things, how we consume things – and at the same time how we overcome that, and how we organise a transition to a more fundamental sustainability on this planet. I wanted to do research that had relevance and I strongly believe in the responsibility that comes with knowledge – the privileged position which you have as a researcher in society. I feel incredibly privileged (to be leading EEA), this is a fantastic organisation. We take a systemic view, we look at four systems in society we think will need to become fundamentally more sustainable: energy; food and agriculture; transport and mobility; and urban and built environment systems. All of the elements are connected, pieces in the knowledge puzzle, and our value is in connecting the dots. Sustainability for me is living well within the limits of the planet. That means taking those limits very seriously as a boundary condition, it’s not “living well and also thinking about the environment”, it’s living well with the limits of the planet, it’s a very different thing. We need to move away from this idea that that we somehow have to pay attention in the socio-economic also to the environment and when we do we call it sustainability. In the long run, on a finite planet with limited resources with more people rightly demanding a decent lifestyle. Sustainability is not about adding a little bit of environment to social and economic development – it’s about fundamentally organising our society while embracing the boundary conditions, and these are about environment and climate and natural resources, that’s the real meaning for me about sustainability. We need a higher integrated approach (than a pillars approach), the issue is not adding a green pillar to the economy and then a bottle of champagne when the green economy grows 50% (from 6% to 8%) – the real success is greening the economy, which is a very different way of dealing with natural resources. (Sustainability is)… going from a linear model where you dig stiff up, you produce something that you use a limited number of times, then you throw it away. We need a circular economy, it’s about decarbonisation of our core systems, rethinking our energy systems, it’s about fundamentally understanding our ecosystems and the value of natural capital. The so-called conflict between agriculture and nature – which you see in many countries – I don’t think the fundamental question is how we can solve the conflict between nature and people and farmers, I think the fundamental question is how we have come to a system of food production and consumption that is a key stress factor on the environment, when the basis should be the environment. That points to a much more integrated view of long term sustainability. We will have to make our core systems of production and consumption essentially sustainable. We have decoupled our economic production to a large extent from forms of pollution, but in essence, we need to move to a deeper, more systemic long term thinking. Moving from the Venn diagram to an egg model: where we organise our socio-technical system with the environment, not just taking environment into account – that’s a pretty fundamental paradigm shift. We need to understand the dynamics of locking in the characteristics of our current unsustainability, and then we need to understand how we can nurture more niche innovation and give that the space to become more mainstream and to upscale. We have to accept failure (in those innovations). The change we need is so fundamental it will require experimentation and it will require thinking and acting out of the box – and we can’t expect everything we invest in to work. Encouraging niche creativity and innovation, and at the same time understanding what locks us into unsustainability is key. (can we get transition incrementally?) The jury is out there. Yes, in some way we can go in incremental steps – if you think of urban mobility… Copenhagen’s mobility has been incremental but challenging deep assumptions – it is now operating at the speed of the bicycles – that’s quite a paradigm shift. I think it will be a mix of more abrupt change and incremental change. We need to understand where the tipping points are – when can we say we are really entering a new paradigm. Last year was the first year that we added mode renewable energy capacity than traditional capacity – is that a tipping point? It’s easy to shout from the sidelines that we need a revolution, but when you’re trying to push from within the system you realise that you shouldn’t under estimate the forces that are embedded within the current system. I believe in the capacity of the system to point in the direction. The 7th Environment Action Programme is a very progressive and rather fundamental document. It was formulated after the Global Financial Crisis and people said “it’s all going to be about the economy and jobs now”, but this proves them wrong. I believe in the adaptive capacity and forward thinking of institutions, but of course you need pressure from society, academic and other knowledge work to point in the right direction, critical forces outside and inside the system. What we do (EEA) should be aligned to the policy agenda, how we do it comes from our independence – we are a critical voice. We (EEA) don’t consider communication as a tail-end add-on to what we do, it is an integral part of the approach we have to policy making. If we understand that the challenges of changing our system are rather complex and there are degrees of uncertainty in that, then we should find a language, find images to communicate that – because it would be almost intellectually dishonest to present them as single cause issues, or simple issues. We see that on social media “if only we would do this simple thing we could solve it” but it probably would not – most issues in society are rather complex, if it only took a five minute decision in one direction, then we probably would have done it. We have a duty to explain complexity, but we do it in terms that speak to those who have to make the decisions, and that’s not easy. We need to move from an efficiency to a transition paradigm. The air we breathe, that enters my body is the result of polices that have been implemented or not, so in a way that is political, what I eat is political, my body is political. The structured agency debate – we all have responsibility, but we do it within systems that surround us. (EEA’s) communication framework, five narratives, storylines that frame things. One of our core storylines is that environmental issues are not at the outskirts of the debate – this is about production and consumption, hence who we are as a modern society. So it’s at the centre of the debate, the centre of distribution and hence the centre of societal issues. For a lot of people, environment is sort of on the outside: “if we solve the social and economic issues, then we’ll have time to talk about the environment, you’re not in the room”. Well, yes, we are in the room. Living well within the planet’s limits is a necessity, not a luxury. We (EEA) are not doomsday thinkers or communicators. Yes, we have serious information, and yes we need to face reality – whether it is implementation gaps or trend lines that are not positive…but I think we have found a language to say “the problems are serious, but we see a lot of pathways, or at least potential pathways to move out of this and go into a better life that is future oriented”. That, I think has opened a lot of doors for our message. Areas of the world clearly need qualitative growth, but that doesn’t mean we need to organise those urban infrastructures around individual car use, that doesn’t mean we need to organise food systems based upon unsustainable consumption of meat and sugar – but the need for qualitative growth we cannot ignore, it would be unethical. We need to reflect on what growth means in a global perspective and also draw the consequences of growth for those not in need of quantitative growth – the contrary, and need to reflect on the footprint of our current lifestyle. (Success) The agency produced a State and Outlook of the Environment Report that made clear the need for transitions in a way that engages others to discuss and think of a positive future, and not in a way that closes the debate or marginalise the environment. (Activist?) I consider myself very much convinced of the responsibility that comes with knowledge and the specific knowledge in my role, so yes. I think I have the responsibility to use the agency (small a) I have as an actor, so in that sense I could be considered an activist. As an academic I was active in environmental organisations. I don’t see a conflict, I had a very clear line. (Motivation) I love what I am doing – it’s science based, knowledge based policy work. I don’t just manage, it’s knowledge and value based in a highly relevant context, I find that fantastic that I’m allowed to do this. (Challenge) Translate our fundamental analysis in a way that keeps the momentum going in Europe, going in the direction of transition. (Miracle) The discourse that environmental and climate policies are against economic interests would disappear from our planet. (On a daily basis – other places learn from Copenhagen’s mobility pattern – what a difference). (Advice) Pessimism has never really solved anything, we have to be realistic optimists – that motivates us too, to be active participants in change – in other words, if you want to change things, try to be the change you want to see.